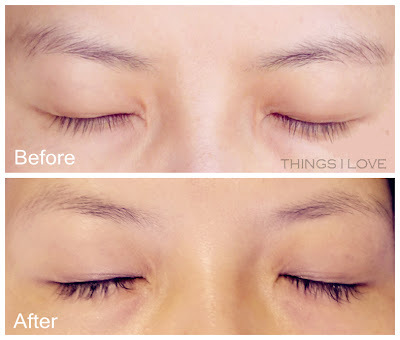 Things I Love: Eyelash Extensions - Are They Worth it? We all want thick luscious lashes and many of us spend a lot of time and money curling, combing and swiping copious coats of mascara to achieve that fluttery look. Some of us may be genetically blessed enough that not much work is needed to achieve eyes framed by fluttery lashes. For the less fortunate like yours truly, we relegate to using false lashes for those special occasion but they can be so fiddly to apply at the best of times and looks, well, just too fake. In recent years, the use of false lashes has created an industry of false lash extensions using either individual acrylic or silk lashes. This is where individual lashes are semi-permanently glued to the base of your natural lashes, blending in so that your lashes are instantly thickened and depending on the length you use, lengthen slightly or dramatically. I recently gave lash extension a try at a local lash bar in North Melbourne, hoping to get a natural but fuller, longer lashes that would shorten my morning makeup routine. The process to fill my lashes with acrylic lashes took about 30 minutes as it was my first time but I’m told when getting refills where you are reapply on areas where the false lashes has fallen off, the time is shorter. I opted for the classic or natural look which I thought would be more suitable for daily wear, especially in the corporate environment. 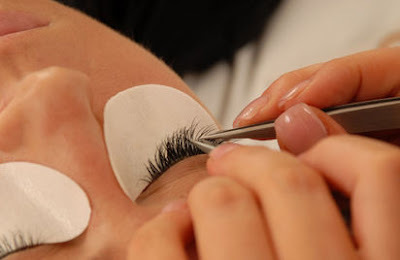 Your eyes are closed (they are actually taped) the whole time your lashes are applied and there is no discomfort at all, you feel a bare wispy touch on your eye lid when the technician is apply them onto the base you’re your lash. When done, I can see a subtle but noticeable difference to my lashes but it was not dramatic enough that you could pin point that I had extension to my lashes, which was exactly what I wanted. My lashes were now longer, more defined and fuller but very natural looking and there was no tell-tale sign of the thick lash band that one gets with strip lashes. I looked like I was naturally blessed with fluttery eyes. No more panda-eye due to smudge mascara as you don’t need to use one. Oily eye girls will understand this and rejoice at this benefit. Last a few weeks (up to 3 weeks) before refills are required. The negatives of lash extensions were becoming apparent after the first day as well. The lashes need to be dry for the first day for the glue to set, so don’t go into the salon with heavy eye makeup and definitely gon’t go splashing water all over your face when washing, which felt very weird for me. Further, my eyes, initially not used to the extra weight of the lashes, felt heavy and it felt like I had to lift my eye lids consciously just to keep my eyes open and even though it’s most likely my imagination, it took a day to get used to. I stopped using my favourite go to eye products (namely eye-liner) as that requires the use of oil-base makeup remover to take off the product and that would risk dissolving the eyelash extension glue pre-maturely. My eye shadow makeup also took longer to remove used water based makeup, meaning that the time I saved in the mornings are now going toward the time taken at night to take makeup off. In fact, after a week, I ditched all forms of eye makeup all-together when just going to work as it was more trouble than it’s worth during removal (the very reason I has lashes done in the first place was to save time!). I also experience some digging of the lashes into my eyes when I blinked which caused some irritation but that was resolved by curling my lashes again so the angle is greater and less likely to irritate my eye. (I’m thinking then that I should have gone for silk lashes which would be softer but also more delicate and fragile). As the days went, I started to notice some small issues. Within 3 days, my first lash extension fell off. Actually, it snapped off along with my natural lashed as it was permanently glued to it. Within the first week I think I counted about 4 more lashes falling out. All this happened despite the extra care taken to avoid weakening the lash glue. My own lashes always snapped off with each breakage as well, meaning that when the extensions fall out, my eyes had fewer lashes than I started off with. Temporary heavy feeling of eye lids. This would be especially the case when getting longer and more dramatic extension so bear that in mind if you are just going for an everyday look. Extra care required for makeup removal and inability to use oil-based makeup remover. Extra care is also required when facial cleansing around the eye area. Cotton pad fibres getting caught in the lashes during eye makeup removal. Extra care is require otherwise you’ll need to spend extra time tweezing out these fibres. Occasional digging of lashes causing irritation to the eyes, resolved by re-curling lashes. 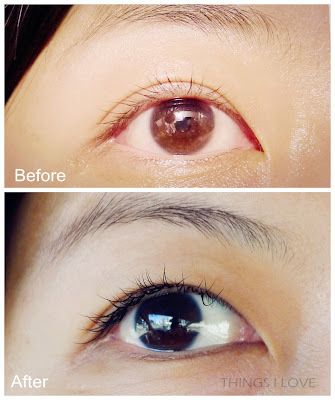 Weakening of own natural lash due to weight. I suspect long term extension would unduly stress out natural lashes so it would be a good idea to give extensions a rest for a few months to let the nature lashes recover and strengthen itself again. Expensive. A full set of extension can set you back about A$99 (I paid half that as I had a voucher) and refill are less but given that you need to top up every month, it can become very expensive habit very quickly. For me, the biggest negative is the inability to use smudge proof liquid liners (a must for me as I have very oily eye lids). Unless I got more dramatic lashes, I feel that eyeliners can dramatise and play up the eyes more effectively than my “classic” full lashes could. Not all is lost though. I enjoyed my experience of eye lashes and enjoyed the smudge free eyes for the past 3 weeks but I won’t be going back any time soon as I see lash extensions as more of a special occasion treat, given the cost and the cons above. I’d highly recommend them for important photographic event such as weddings, engagement etc (much better than applying false strip lashes and you don’t want your wedding photos marred by those garish spines of those lashes). For everyday use, I’d stick with my trusty eyeliner and mascara to widen and dramatise my eyes. Have you tried lash extensions? what are your experience with them? Ah I never knew there where so many things that can't be used on the eye area after getting eyelash extensions - makes me think twice! You're welcome Jen. I was rather surprised by the amount of upkeep (or things I can't do) required so definitely one of those for 'very special occasions only' treats.